The Royal Garrafon & Dolphin Encounter is 55 minutes long with 15 of those minutes spent on a briefing about dolphins. You will learn how to interact with the dolphins and gain knowledge about their behaviors, eating habits, and anatomy. This experience will create unforgettable memories for you and your family! The Royal Garrafon & Dolphin Encounter at Garrafon National Reef Park in Isla Mujeres is a family-oriented program that enables anyone who is at least 4 years to swim and play with the dolphins. Be sure to arrive 30 minutes early to ensure you don't miss the important 15-minute briefing before diving into the water. During the briefing, you will learn everything you need to know to have fun with the dolphins, such as how to kiss them, play with them, and ask for a handshake. 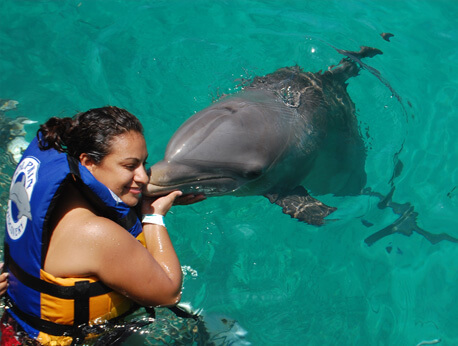 You will also learn fascinating facts about dolphins and the Isla Mujeres environment. Your vacation in Isla Mujeres will be even more fulfilling with a better understanding of its beautiful environment. After the 15-minute orientation, you'll have 40 minutes to interact with the dolphins. You can use anything you've learned to play with the dolphins and see their neat tricks. Give them a kiss or a loving hug in exchange for showing their talents. Just be careful to not fall too deeply in love with these adorable animals. You must bring your own towels to dry off with after your dolphin swim. The venue and many other places in the park only accept cash as payment, so be sure to be well-equipped with Mexican pesos before leaving the hotel. Also be aware that photos, meals, and transportation fees are not included in the experience. The dock fee is $8 USD and ground transportation is $16 USD. Children under the age of 4 don't have to pay a dock fee. Because the venue is located in Garrafon Park, you have close access to a national open bar, a lunch buffet, and hammocks. You can satisfy your appetite after playing with the dolphins and relax in one of the hammocks in the park. There is also snorkel equipment and kayaks nearby, so if you're up for more adventure after your break, you don't have to travel far.